This edition of Field Trip Friday takes us to Kissimmee, FL, just outside of Orlando, where my partner in adventure Laure Ferlita and I “forced” ourselves to join a chocolate factory tour at Chocolate Kingdom. The tour was interactive, which means we got to taste things! Though the tour was a bit goofy (somewhat touristy and aimed at children), our guide was cute and enthusiastic, imparting tons of interesting facts and history, and information on how chocolate goes from cacao bean to delicious treat. We also ordered custom chocolate bars which they made in front of us. I chose dark chocolate, pecans and caramel. Yum. Chocolate is made from a seed that comes from a fruit tree. 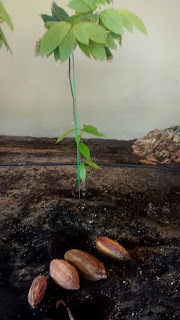 The name of the tree, Theobroma Cacao, means “Food of the Gods.” The seeds/beans grow in a football-shaped pod. “Cacao” (ka-KOW) is the raw unprocessed form, which will later be called “cocoa” after processing. Each tree produces about 2,500 beans a year, and it takes about 400 cacao beans to make one pound of chocolate. Though it is native to Central and South America and grows throughout the tropics, about 70 percent of cocoa comes from West Africa, according to the National Confectioners Association’s Chocolate Council. 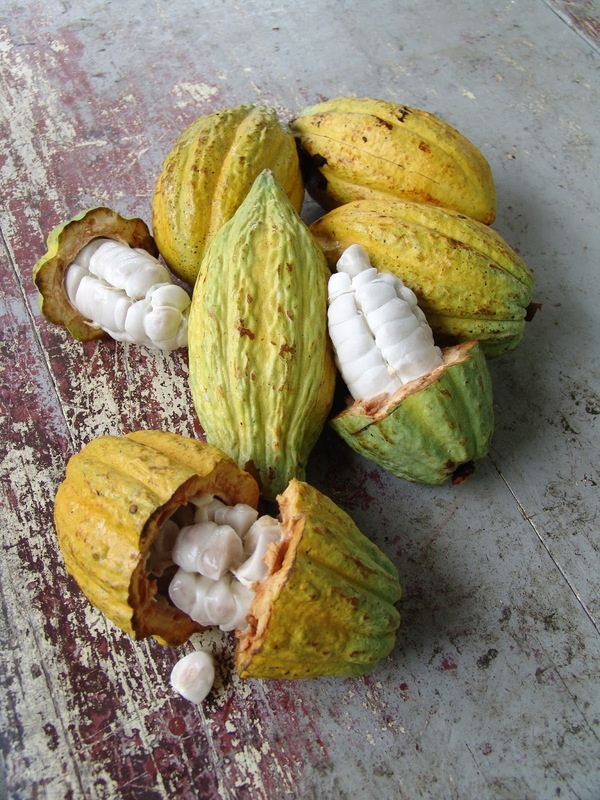 Cacao pods mature throughout the year, and contain about 30 to 40 beans covered in a sticky pulp, which is also eaten and used in drinks. At this point, the beans themselves are bitter. After the beans are harvested, they are fermented (sweetening the flavor and making them more chocolatey), dried in the sun, and shipped to a factory. Factory workers sift the beans, weigh them, and sort them by type. 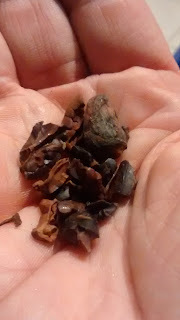 They are roasted, cracked and winnowed, and the resulting pieces of bean are called “nibs.” We tasted some of these on the tour, and while they’re not sweet or even very chocolatey-tasting, I liked the flavor—they’d be good on ice cream. The nibs are crushed and ground into chocolate liquor (there is no alcoholic content, despite the name). The liquor can then be crushed in a press to remove the cocoa butter (eventually producing cocoa powder), or be made into chocolate with the addition of sugar, vanilla, more cocoa butter, and milk (for milk chocolate). 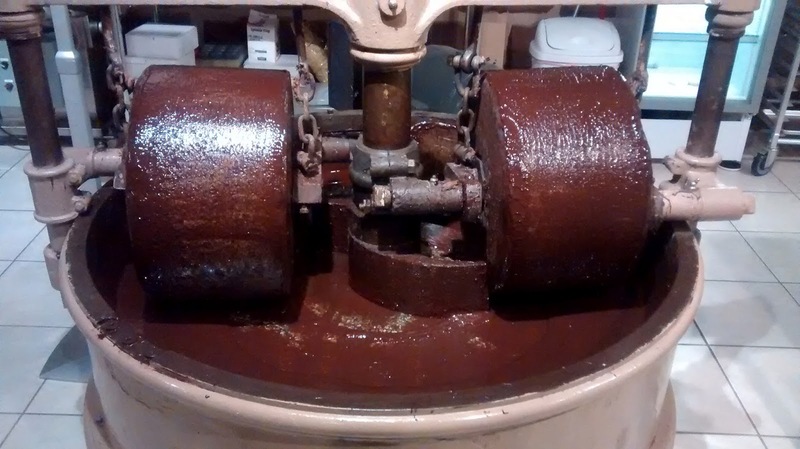 This chocolate will be refined, mixed, and otherwise processed to produce the chocolate we eat. Cacao beans were used as currency in early Mesoamerica. Chocolate can have notes of berry, citrus, black licorice, cinnamon, mushroom, toast, and other flavors, according to one professional chocolate taster. Where the chocolate was grown, under what conditions, and how it was processed helps to determine what flavors the chocolate will have. The melting point of cocoa butter is just below our body temperature of 98.6—that’s why it melts in our mouths. Sadly, the chocolate I brought home after the tour is just a memory. But, I hear Chocolate Kingdom participates in a Festival of Chocolate every year in Tampa—sign me up! What’s your favorite chocolate treat? Now that sounds like my kind of tour!! And you didn't invite me. Haha. Sounds like fun. Wish I could have been there. Dark chocolate is my favorite. Cheryl--You would have been most welcome to join us! Their dark chocolate was delicious, nice and smooth and not bitter. Sigh. Yes, my chocolate is but a memory as well! Good fun, good friends, good chocolate. Cheryl, it would have been fun! Wish you could have joined us.